Born in Austin, Texas, Shannon grew up outside of Vancouver Canada. Her mother Jacqueline Oldham was an “S” dressage judge in both Canada and the USA, and instilled in Shannon a love and knowledge of classical dressage from an early age. Shannon was lucky enough to grow up with horses in her backyard, and evented to Intermediate level as a teenager, as well as show jumped and worked on the Thoroughbred racetrack. She went through the Pony Club levels to attain her “A” status at the age of 18, and also got her Canadian Coaching Level 2 status. After completing a Bachelors degree in Animal Science at the University of British Columbia and a Masters degree in Equine Nutrition and Exercise Physiology at Texas A&M University, she went on to become faculty at Lakeland College and Olds College in Alberta, Canada, and then moved to Massachusetts with her husband Lorne to take up a faculty position at Johnson & Wales University. 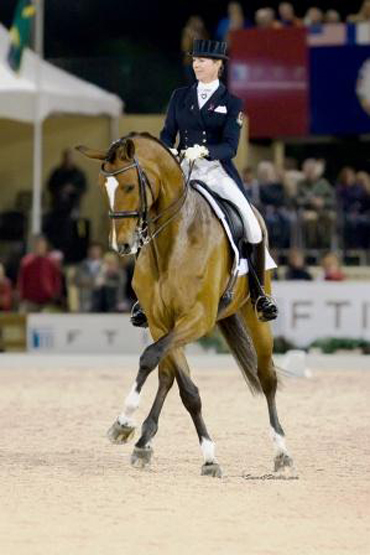 Shannon is a clinician with www.Dressageclinic.com which is a super video website featuring top dressage trainers from Europe and North America. You can watch videos of Shannon teaching all levels of students as well video and her commentary when training all levels of horses, from a baby 3 year old to Grand Prix.